When The Local Good first got started with email marketing, they were in a position a lot of businesses and organizations can relate to. Without an existing list of email addresses, they had to build their list from scratch — one name at a time. As a nonprofit that specializes in helping the population of Edmonton, Alberta live a more green and sustainable life, the team behind The Local Good was confident in their ability to build a dedicated and long-lasting community. And that’s exactly what they did! Over the course of a few years, they grew their email audience from zero to more than 3,700 contacts. That audience has become one of their most valuable marketing resources, helping them gain exposure, host full events, and surpass fundraising goals. You can do it too. Growing and maintaining an email list can take some work but when done right, the payoff can be huge. The first step of building a loyal email list is making sure you have a safe place to store your contacts’ information and an easy way to send them mailings. For The Local Good, choosing the right email provider started with looking into what other businesses in the area were using. Once you choose a provider to work with, you’re ready to think about what kind of messages you want to send out. How often do they want to hear from you? For The Local Good, hosting and promoting a variety of local events means they are reaching out to subscribers on a weekly basis. The timing of your newsletters depends on how often you have something relevant to share. After you decide on a general frequency, be sure to make your mailing list aware of this so that they can be on the lookout for your email in their inbox. The Local Good lets their audience know how often they’ll be sending right on their website sign-up form. That way, subscribers will know what they are signing up for and look forward to future messages. Even if you feel like you’ve been promoting your newsletter for a while, don’t forget that this information will still be new to your new customers or members. You shouldn’t assume they’ll always seek this information out on their own. A simple sign-up form online or in-store can go a long way, but don’t forget about options like Text-To-Join or the Join My List App for Facebook. Permission is also an important consideration when collecting contact information. With the recent CASL policy going into effect last summer, Ally and her team have revisited their sign-up experience to ensure they have the proper consent for their contacts. “We know the people who sign up have actively chosen to sign up,” Ally explains. One of the most important things you can do with your email newsletter is to send something unique to your audience. Write your emails with your audience’s interests in mind. Point them to content about topics you know they’re interested in — whether it’s an original blog post or curated content. Include a special offer or promotion when you can, and experiment with different types of media like images and videos. For The Local Good, one of their biggest goals with their email marketing is to increase event attendance. 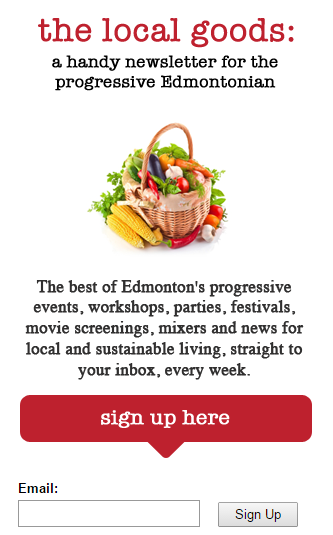 Their newsletters are equally informative and upbeat to generate excitement for upcoming events. 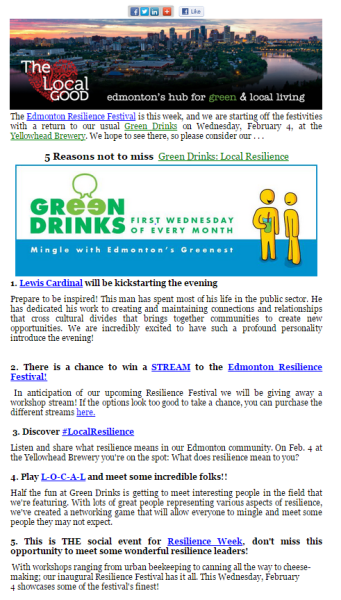 Here’s an example of a recent newsletter where they included five reasons why members should attend a “Green Drinks” event. Using your email reports can help you answer important questions like: who are your most engaged audience members?, what kind of content are they enjoying the most?, how are your emails driving real results for your business or organization? Ally tracks her results and makes regular improvements wherever she can. This includes trying out new ways to present content, and also regularly going through and updating contact information. “I think one of the reasons our email open rates stay so high is because when our emails bounce back, I go through and remove these contacts each month,” says Ally. 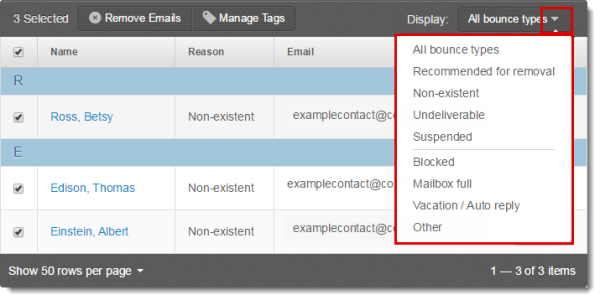 Managing email bounces and updating contact information or removing contacts with ongoing issues is easy to do within email reports. By using her reports and staying on top of her email list The Local Good sees an average open rate of 37 percent. In addition to open and bounce rates, Ally pays attention to her click-through rate. This is one of the strongest indicators that the emails are driving business results in the form of increased donations and event attendance.